There’s no doubt that college life can be really expensive. Even native students can sometimes run out of funds; to say nothing of international students who move to a foreign country to study. It’s quite overwhelming… the thought of running out of money. Being a student isn’t easy. Besides an academic pressure, there’s also a social pressure. Your friends may be partying tonight and you just can’t be there. Why? No money to party with. If you’re a student, and you have no clue how to manage your financial situation during college years, you’ve landed on the right article. 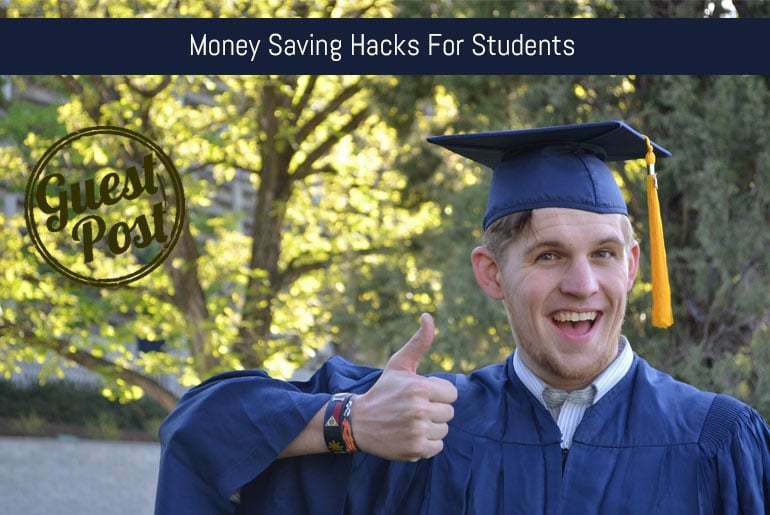 Today you’ll learn few money saving hacks that will just make your college life better. Let’s begin. Being a student comes with a lot of benefits. If you didn’t know by now, there are hundreds of companies that are willing to offer student discounts. From food to clothes, from electronics to travelling, you can take an advantage of a variety of student discounts. In order to benefit from these discounts, you must provide your student ID. Finding these services isn’t hard at all. Find a local newspaper and look for a lists of businesses in your area. If by chance there’s no information in your local newspaper, check this online resource. The website offers a comprehensive list of businesses that are willing to drop the prices for you, just because you’re a student. Getting a scholarship is often essential if you want to “survive” college. There are lots of scholarships every student can apply for. All you need is to fill the blanks and to write an essay. Though it may sound easy, you need to follow certain rules to write a winning scholarship essay. You can also find services that can help you with the researching process. If you’re an international student and you have no idea how to make a proper scholarship search, I’d suggest you go for a paid service and let them do the hard work. If you believe you’re capable of conducting your own research, check out InternationalScholarships.com. This scholarship search engine is free, and can provide you with a lot of useful information. Did you know that you can save up to 60% of your money by just renting your textbooks instead of buying them? Many college students have no clue about this useful opportunity, so they keep buying their materials for bigger prices. Each semester comes with something new. That means new textbooks and materials. You mayuse different online resources to find the books you need. Here are some of them: Chegg; eCampus; BookRenter; TextBooks. These are only few of the websites that offer discounted rental prices for textbooks. With a quick Google search, you can come across many more. Oh, and most of them have free shipping! Most of the college campuses have at least one resident assistant spot. As the name of the position suggests, a resident assistant is responsible for organizing many types of campus activities. Besides that, he’s also helping new students with common issues and settles disputes. It’s just like volunteering, but you get some really nice benefits. For example, a resident assistant will receive FREE accommodation and food. If you care to become one, you must understand that there are also big responsibilities. You’re either in or out, because many students count on you, and you usually have to be there for them. Instead of organizing your life outside your campus, you should really consider spending more time inside. You can have a social life even if you’re not going out every day. Many campuses organize social events, cultural events, movie nights, and even sport activities. Guess what, most of the “inside” activities are really cheap or even free. If you’re a gym person, look into your campus facilities. More than often you’ll find out that there’s a campus gym that offers big discounts. Why spend more time and money for an outside-campus gym when you have all you need right in front of you? For example, you don’t really need an expensive cable package. You’re a student; you don’t have time for a lot of TV. Maybe you’re not even watching TV, but you’re signed up for an expensive package that you’re paying for every month. Cut it out immediately! What about your phone package? Is it expensive or affordable? If you find out you’re paying too much for more than you need, switch to a basic package that fulfills your needs. There are also many types of college meal plans. When you first started, you may have chosen an expensive one, thinking that food won’t be enough. Later you found out that you don’t really need such a big college meal plan, but you never took the time to change your options. It’s critical that you take some time alone and analyze your expenses. Take a piece of paper and make a list with all your monthly expenses. Next, start marking those that can be cut off and those that can be downgraded to lower expenses. Do this every two or three months, and never lose track of your spending habits. Nobody said college life is easy. It’s exciting, entertaining, hard, painful, but not easy. Money will always play a huge role in our lives, and the more we take care of it, the better lifestyle we’ll create for ourselves. If you’re smart about it, you’ll take into consideration all of the above mentioned money saving tips. If you really want changes, just taking them into consideration isn’t enough; you have to take action and do the necessary changes. Believe me, there’s nothing worse than not having the necessary funds during your college years. Robert Morris is a freelance writer who shares tips for students, business advice and latest technology trends. Currently, he is working as a blog editor and a writer at essay writing service NinjaEssays.com.